As always, we are THRILLED to be a part of the Coffee Lover’s Blog Hop…both as a participant and sponsor! You can find out all the details about the blog hop and prizes HERE. Come join in the fun!! I love the sentiments in our FOR THE LOVE OF LATTE set, but I wanted something a little more general here and reached for the “hello, my friend” sentiment from A FRIEND LIKE YOU (one of my favorite sets ever). Again, don’t forget to check out all the details for the hop HERE and join in the fun! We’re super excited to be a part of the Coffee Lovers Blog Hop both as a participant and a sponsor! The theme for this one is Winter/Holiday and everyone is invited to play along! All of the details for the hop, prizes and how you can join in the fun can be found HERE. I had a lot of fun creating a card for this hop! The base of the card is covered with kraft plaid paper (LOVEEE this stuff)! I stitched around the edges to add a little bit of texture and I think it’s the perfect touch to this card. From there I layered 2 large wreaths cut from the WREATHS Confetti Cuts die set. On top of wreath is a cup from the CAFFEINATED CUPS stamp set (cut with the coordinating Confetti Cuts die set). I colored it in ombre red, just like the red cups currently found at Starbucks. I cut the cup sleeve from kraft paper and ran it through my paper crimper so that it would resemble a real sleeve. On top of that is the word “joy” cut from the WINTER WORDS Confetti Cuts. For a finishing touch, I added gold hearts cut from the YOU ARE A STAR Confetti Cuts die set and topped them with gold sequins and gold rhinestones. Have you played along with the SKETCH FOR YOU TO TRY for October yet? If not, grab those stamps and Confetti Cuts dies and come play along for a chance to win a gift certificate to the Reverse Confetti store. All of the info and link list for this month’s SFYTT can be found HERE. See you tomorrow for MAKE IT WITH ME MONDAY! Happy October and hooray for fall, although it hardly feels like it is upon us here in North Texas. October pretty much marks the turn of the seasons…and you never know if you’re going to freeze or sweat on Halloween. If you’ve been watching the MAKE IT WITH ME MONDAY scopes (via Periscope), you’ve heard me mention that we are having an October release. We generally release every other month, but we have bumped up our Holiday Release to October 8th this year. There are new stamps, new Confetti Cuts dies, new Quick Card Panels and MORE! Sneak peeks start Monday, but you can WIN IT BEFORE YOU CAN BUY IT over on Facebook starting at 8am CST today! The Confetti Crew has been busy whipping up some fabulous inspirational cards! Speaking of sketches, did you see that we’re on PageMaps? Click the banner below for some fun inspiration and stay tuned for a chance to win! Okay, now it’s your turn! Show us how you use this sketch for a chance to win a $20 gift certificate to the Reverse Confetti store! Now, let’s take a peek at what the Confetti Crew has been up to this week! Howdy, ‘Fetti Fans and welcome to Confetti Camera! “Set ’em Up!”….that’s the theme of our Confetti Camera projects, so when I spotted a trio of vintage jello molds that I picked up from the thrift store, ideas started to brew. Are you at all surprised that I managed a coffee theme? 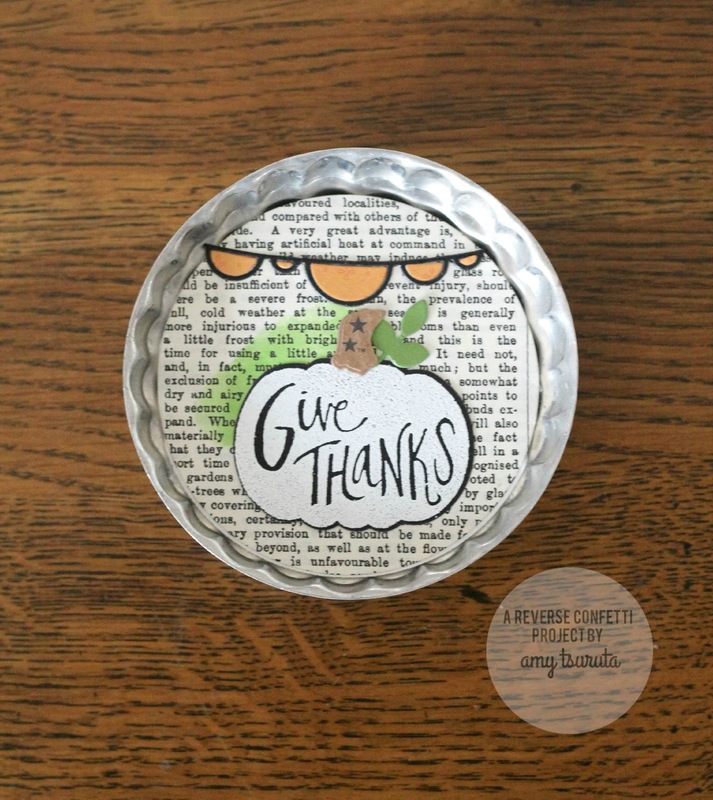 I started by die cutting a trio of 3.25 inch diameter circles of patterned text paper. They literally drop into the mold and are held up by the rim. Starting from the left and working to the right, Let’s start with the coffee one: I combined the new Caffeinated Cups and For the Love of Latte. I love having the coordinating Caffeinated Cups Confetti Cuts! The coffee cup sleeve has been paper pieced with patterned paper and topped off with a wood veneer piece. Give Thanks: This was the first one I created in the series. I adore the Pumpkin Patch set. The possibilities are endless. I heat embossed in white on black cardstock. Do you see the stem? I used the coordinating Pumpkin Patch Confetti Cuts and used a Starbucks coffee sleeve, carefully cutting out the stars. The beauty of the new Leafy Confetti Cuts, you can trim them down for a totally different look! Lovin’ the Double Scallop Garland Confetti Cuts, awesome to be able to have a delicate border! Have you noticed I generally incorporate the color green with my coffee cards or try to include an upcycled coffee sleeve? This Latte one, uses Caffeinated Cups and For the Love of Latte. The sentiment has been stamped on the Label Me Confetti Cut, I trimmed the right side to follow the curve of the circle. 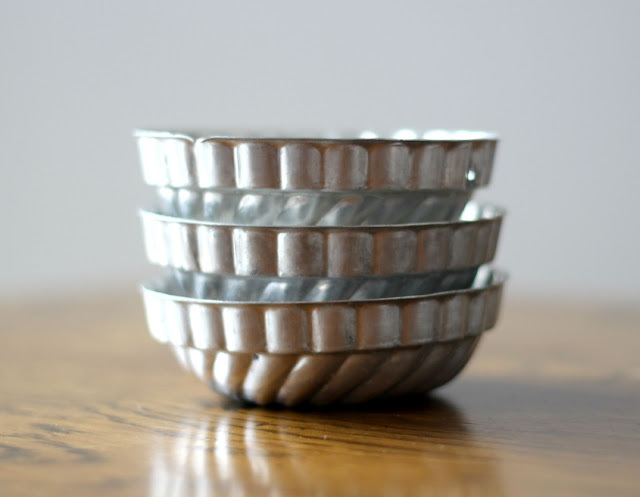 I will be lining these up on a white rectangular plate and using it as my center piece on the kitchen table. Another option would be to hot glue ribbon loops on the bottom of the molds so they can easily hang on the wall. The Jello Molds are little treasures, I use them to organize my wood veneers and recently starting to use one when I start on projects. Whenever I finish using a die, I pop it into the mold and when I’m done with project, I gather them all up and put them away. I’m notorious for losing dies. They eventually ‘reappear’…but currently I do have one MIA. Today is the third and final day of the COUNTDOWN TO CONFETTI! Tonight at midnight EST all of the new product…6 new stamp sets, 8 new Confetti Cuts die sets and new *limited edition* QUICK CARD PANELS. On Facebook, simply leave a comment under the graphic. One person that comments on the graphic by 1pm EST **TODAY** will be randomly chosen to win one a $15 gift certificate to the Reverse Confetti store. Winners for both the blog comments and Facebook comments will be announced here on the Reverse Confetti blog as well as on Facebook. I’ve mentioned a couple of times over the last few posts that we are listening to YOU and some of our product comes about from ‘Fetti Fan comments. While we can’t do everything that’s suggested, we really do listen and take to heart what you are saying and we see if it will work with the Reverse Confetti product line. This set is made so that you can mix and match the word “coffee” with the other sentiments in it. Here, I stamped the word “coffee” in brown ink and then the remainder of the sentiment in black ink. I added the coffee cup, also stamped with latte and art for the mug itself, along with a matching ribbon and stitched panel (created with the OFFICE EDGES Confetti Cuts die set). **NOTE** The latte art in the BE A BARISTA set will fit in this mug AND the tall cup in CAFFEINATED CUPS!!! This makes it easy to get more use from your stamps and create lots of fun new projects! This card features one of the quippy little sentiments and the tall cup, latte art and sleeve. The heart is from the LOVE NOTE Confetti Cuts die set and I tied it off with some linen thread. The splatters are from the COLOR ME HAPPY stamp set. For the coffee (or tea) drinker, the Caffeinated Cups set includes 2 cups, latte art, and 2 decorative artwork images for the cups. Images designed to pair with the For the Love of Latte stamp set. Coordinating Confetti Cuts die set available (sold separately). 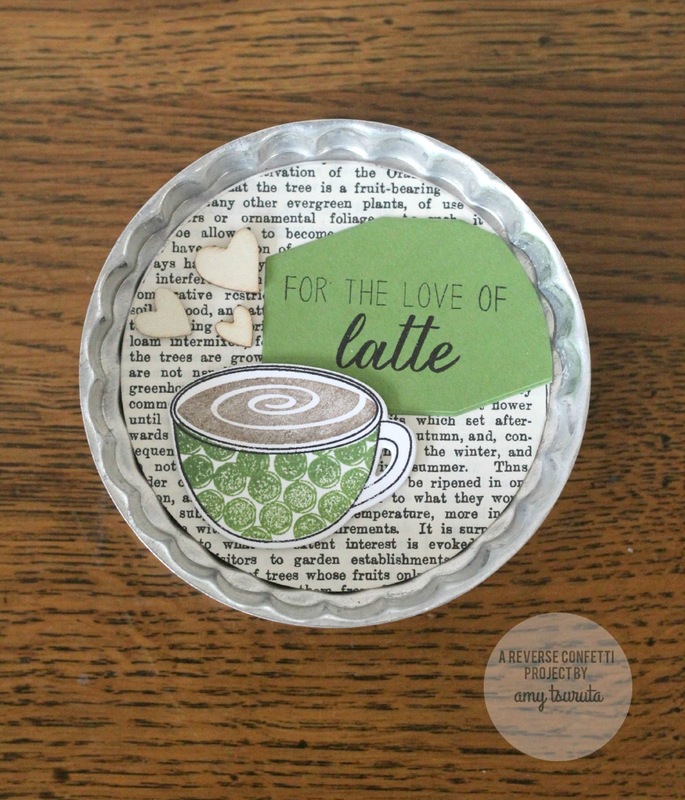 Featuring a combination of fonts, the For the Love of Latte stamp set includes a variety of coffee-themed sentiments. 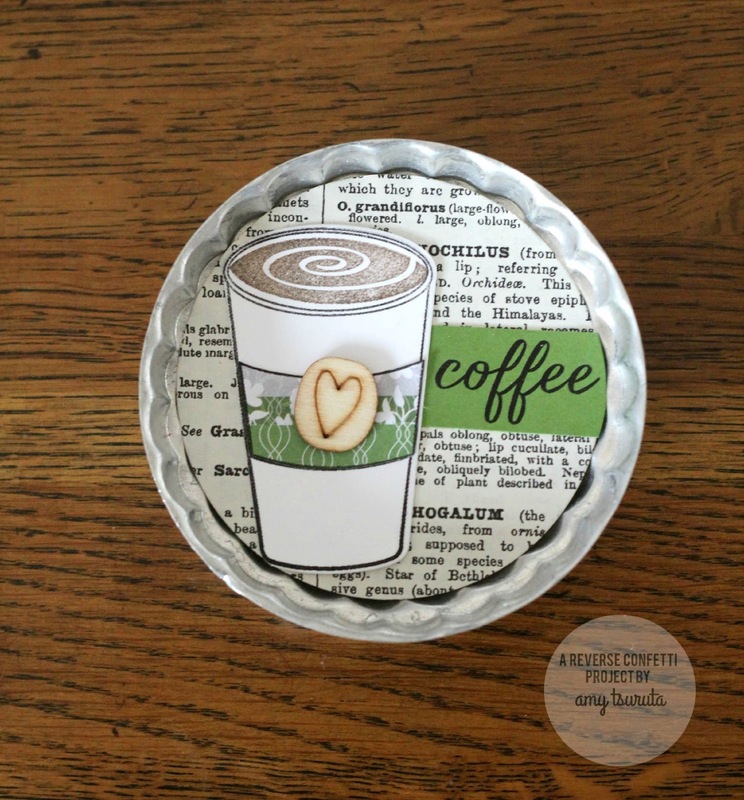 Use the word “coffee” to complete the sentiments and then pair with the Caffeinated Cups stamp set and its coordinating Confetti Cuts set, for cards, tags and other paper crafting projects. 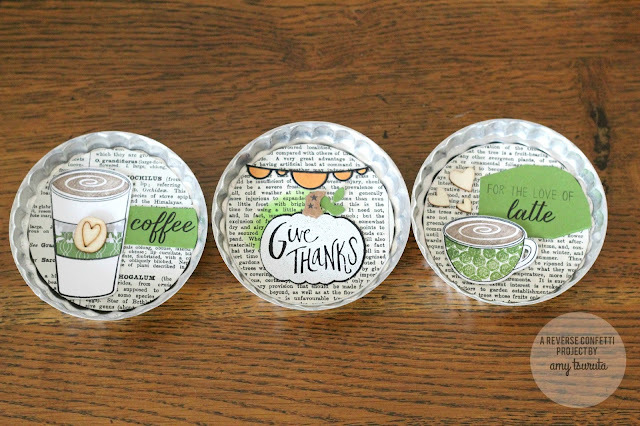 The Caffeinated Cups Confetti Cuts die set features coffee-related dies that coordinate with the Caffeinated Cups stamp set, as well as the Be A Barista stamp set.